The promise of falling asleep faster, reducing the time you’re awake in the night, and sleeping for longer would appeal to most people with insomnia. And if you can achieve this without taking sleeping pills, it’s an even more tantalizing idea. Numerous research studies have shown that Cognitive Behavioral Therapy for Insomnia (CBT-I), can be as effective, and in many cases better, than taking sleeping pills. Both the US National Institutes of Health and the American College of Physicians now recommend that a CBT-I approach should be tried before sleeping pills. This advice isn’t surprising, as CBT-I has been found to improve sleep in 75%-80% of people with insomnia. Furthermore, 90% of those completing a course find that they can stop taking sleeping pills. CBT-I works by helping you to understand some of the possible causes of insomnia, and then supporting you to develop individual self-help approaches. What’s more, although you can attend a clinic for the therapy if you wish, there are now also an increasing number of online courses. These can conveniently be completed at home, and in your own time. CBT-I helps you understand how to sleep better in a structured and guided way, tailored to your individual needs. The overall objective is to change the way you think about sleep, and how you can tackle problems such as stress and worry. These are often the root cause of many people’s insomnia. The best CBT-I programs will lead you through the various stages with exercises and tests as you go along. Based on your results and feedback, for example from a sleep log, the programs then provide guidance on what you should focus more on. The gold standard is to undertake the program with a professional sleep therapist. However, not everyone has the finances for this, or even a local therapist available. Hence the growth in online courses. Basic information about the importance of sleep and an initial assessment. A technique called ‘stimulus control’. This helps you associate the bedroom with sleep, not being awake. How to restructure your sleep time. This might involve sleep restriction, which helps get your sleep pattern in shape. How to manage issues such as worry and stress that can interfere with your sleep. Positive sleep habits like diet, lifestyle, relaxation, and improving the bedroom environment. A key reason it’s so effective is that it identifies the factors which are most relevant to you. The program can then offer you focused advice on where to concentrate your efforts to achieve the best results. Most of the online programs last about 5-6 weeks, with some offering ongoing support after you’ve finished. Time commitment varies, but could be about 1 hour per week to complete the actual online part. However, it can take longer to develop and test the suggested approaches. In 2012, the National Institute of Health reported the outcome from a group of sleep experts who had reviewed a large number of past studies of CBT-I compared to using medications. CBT-I is effective for treating insomnia when compared with medications, and its effects may be more durable than medications. Primary care providers should consider CBT-I as a first-line treatment option for insomnia. In 2016, the American College of Physicians produced a clinical practice guide for the management of chronic insomnia. They again based their recommendations on a large scale review of research into the effectiveness of CBT-I. They made a similar recommendation that CBT-I should be the initial treatment for all adults with chronic insomnia. Between 40% and 50% less time to fall asleep when you go to bed. Up to 60% less time spent awake at night. An extra hour of sleep every night. Subjective assessments that the quality of sleep has improved markedly. CBT-I improves sleep in 75%-80% of people with insomnia and 90% found they could stop taking sleeping pills. Feeling much better during the daytime – not only less tired but also less stressed. There are three basic types of program available. I’ll briefly cover those before looking at specific online programs. With this approach, you’ll have regular face to face consultations with a sleep therapist. They will guide you through a CBT-I program and offer advice as you go along. This is the gold standard, but more expensive and there’s a shortage of qualified therapists. If you suffer from chronic insomnia, it’s worth asking your doctor about this. The treatment may be available on your health insurance, or on the NHS in the UK. The cost is normally calculated per session and varies enormously by location and therapist. Examples are $450 for a six week session, but in some cases you may be charged $100 per session. In group therapy, a small group of people will meet with a sleep therapist at regular intervals (often weekly) and undertake the CBT-I program together. This reduces the cost, as well as providing opportunities for sharing ideas with others. The availability of such group sessions will also depend on where you live, and in many areas are almost impossible to find. If your doctor can’t recommend one, you could try contacting a local sleep clinic. If it’s covered by your health insurance, it could be free. Online programs are where the most development has been over the last few years. It’s partly driven by the cost, and also the lack of available therapists. Research results on the effectiveness of online treatments compared to face to face treatments vary. Some say they are equally effective, but a recent 2016 report suggested that online CBT-I wasn’t quite as effective. our results also suggest that online treatment may offer a potentially cost-effective alternative to and complement face to face treatment. Costs can vary between $50 to $300, depending on the length of the program and amount of online interaction with a therapist. There are various different online CBT-I programs which can be accessed and followed from your own home. I’ve limited this list to those where a recognized sleep expert is involved in the development and running of the programs. I’ve also mainly included those which you undertake yourself, without the direct support of a therapist or doctor. If you consult a doctor or therapist they may well recommend a different CBT-I program which they’re more familiar with. SHUTi is one of the best studied CBT-I online programs, with numerous trials reported on their website and in the medical journals. It took 43% less time to fall asleep. They spent 55% less time awake at night. One of the key people involved is Dr. Charles Morin, who is a Professor of Psychology at the Laval University in Quebec, Canada. He’s a well recognized expert in insomnia, with numerous research articles published. You can either undertake the program through a sleep clinic with a therapist, or directly yourself. Access to research-proven SHUTi program, including 6 interactive lessons delivered over a 6-week period. Personalized Sleep Window recommendations each week. Unique engaging interactions ensure knowledge transfer, foster skills practice and test strategy application. Option to integrate with Fitbit™ Activity and Sleep Tracker. Printable reference materials to share with friends and family. Sleepio is another well-researched online program with numerous trials and testimonials. It’s supported by the well-known expert on sleep and insomnia, Professor Colin Espie, at the University of Oxford in England. 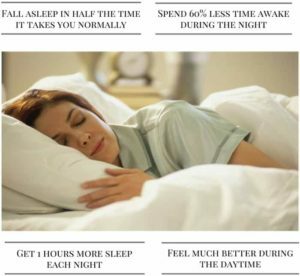 the Sleepio course helped around 75% of people with persistent sleep problems to improve their sleep to healthy levels, compared with the placebo and no treatment conditions which had relatively little impact…an average reduction in time taken to fall asleep of 50% and in time spent awake during the night of 60% within the Sleepio group. The Sleepio program covers all the CBT-I topics above. In addition, you get access to a library of information and all your past exercises. You can also take part in a weekly ‘live group seminar’ with a sleep expert. You can use it to share experiences and concerns with other participants, which could be helpful. They have numerous testimonials on their site. All report positive outcomes, with some mentioning that some parts are difficult, but worth sticking with. Others value the community approach so you can hear how others have dealt with sleep problems. This program is approved in the UK by the NHS, so UK residents might be able to access it for free. The Conquering Insomnia program was developed by Dr. Gregg D. Jacobs, a sleep specialist at the University of Massachusetts Medical School. The online version is based on a CBT-I program developed and used with patients at the university. The program appears to rely more on the general research into the effectiveness of CBT-I, rather than actual trials with this specific online version. That said, Dr Jacobs’ extensive research into CBT-I was used to develop the online version. The website has lots of testimonials, with many saying that the program helped them to sleep better without needing sleeping pills. This program appears to be more standalone than the others, without a facility to interact with other participants. So part of your decision process will be to think about how important this aspect is to you personally. 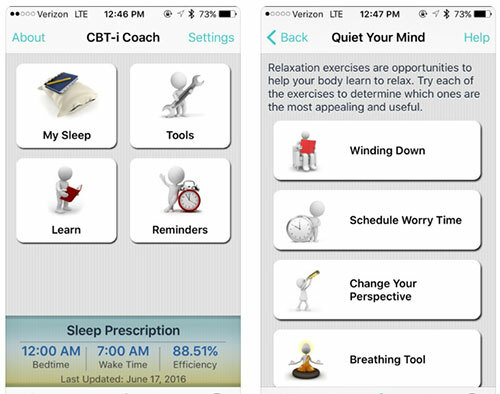 This free App was created to be an extra support if you’re seeing a therapist for your sleep problems. However, I decided to include it here as it’s free and still offers lots of useful tips which might help you. It was developed by the US Veterans Association National Center for Post Traumatic Stress Disorder, Stanford School of Medicine and the Department of Defense’s National Center for Telehealth & Technology. It’s currently the subject of studies into its effectiveness. And although it doesn’t have the same directed approach as the online options above, it has tools and exercises for improving your sleep. You can also use it to keep a sleep diary. If you think you could benefit from one of these programs, it might be worth discussing with your doctor first. This is especially important if you’re currently taking any prescription drugs to help you sleep. A doctor can also check that your sleep problems aren’t due to another sleep disorder or health condition. That’s not to say CBT-I can’t help if you have another condition. You just need to be more cautious about the probability of success and any actions you might take. It’s also important to realize that CBT-I isn’t an instant cure. It takes effort to follow the program and then keep using any techniques long after you’ve finished the actual therapy. Have you tried an online CBT-I program, or do you think it’s something you’d be interested in trying? Feel free to share your thoughts in the comments below. hello all of you, i’m 75 years old and have been fighting insomnia for a number of years. sleeping pills did not affect the problem and my pcp finally told me i needed to see a psychiatrist to find out why i cannot sleep. was awake one time for 5 days. now i know why sleep deprivation is used for torture. the shrink gave me prescription for trazadone(100mg) and xanax (4mg) per day for sleep. the drugs put me to sleep but i woke up feeling miserable,groggy,drunk and dizzy. i was afraid to drive. i was on this regimen for the past two years or so. wanted desperately to get off the drugs. looking for solutions,i found my shuti.com. it has helped tremendously but i still have to take 2 mg xanax to fall asleep. wake up feeling fully rested and full of energy most of the time. also drink cup of “nighty night” tea before bed along with 2 capsules of “restful sleep”, an all natural chinese formula, used for years to treat insomnia. i have been on the shuti program now for at least 2 months but am not completely satisfied and sometimes still have trouble falling asleeep or going back to sleep after waking in the middle of the night. shuti uses a formula to give you a percentage figure at the end of each week that represents amount of time you spent sleeping while in bed. they get this percentage figure from info you supply in a sleep diary that you turn in each day. my first week was 60%. i got it as high as 90.5% but it has continued to drop ever so slightly since. last one was 80.3%. my sleep window was bedtime at 2:30 am and wake up at 8:30 am. during the day i had a very hard time staying awake between 2 pm and 5 pm. not supposed to take naps but i couldn’t help it. this of course would affect my sleep window. Thank you for your comment, and for sharing your experience. It’s very interesting to hear from someone who has tried one of the online CBT programs. I can understand your frustration, especially if you had some success, but it’s slipping again. Can I ask how long they recommend staying with the program for? Have you consulted with someone from the site about your results and how things have been going for you? Perhaps it’s a question, in part, of sticking with it. Sometimes when tackling sleep problems it’s a case of 2 steps forwards, one step back. Hopefully you’ll keep making good progress though over time. My husband is using sleepio. It is good. He does not feel alone with the problem and has answers to his questions. Also there is a professor who leads him every day with questioner and advisers. Thanks for your comment. It’s great to hear from someone who has some experience with Sleepio. I’ve heard good things about it too, so I hope your husband has some positive results from using it. This looks promising. Can I hear from others using these online programs? Thanks for your comment. That’s a good question, but I don’t know where you can get people’s stories of using them. I think you’d probably have to do some digging online to see if you can either find forums where people talk about them, or perhaps the programs themselves have user stories on their websites. Sorry I can’t help more, but if I do find somewhere that has interesting feedback, I’ll be sure to add it here.